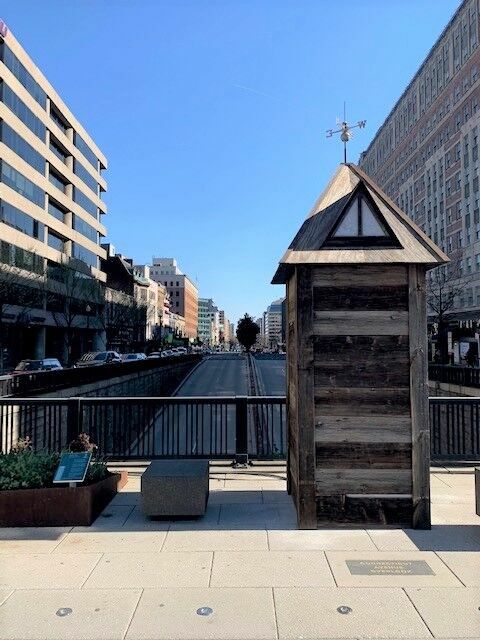 “The Golden Triangle Business Improvement District (BID) opens Layers + Lines, a new public art exhibition on Connecticut Avenue, on April 4, 2019. Bringing together two pieces of art, Up ’til Now by DC-based artist Nekisha Durrett and Axis Mundi by NYC-based artist Kate Raudenbush, the exhibition explores the layers of history in the Golden Triangle neighborhood, the geometries of our built environment, and the lines connecting us to our community. 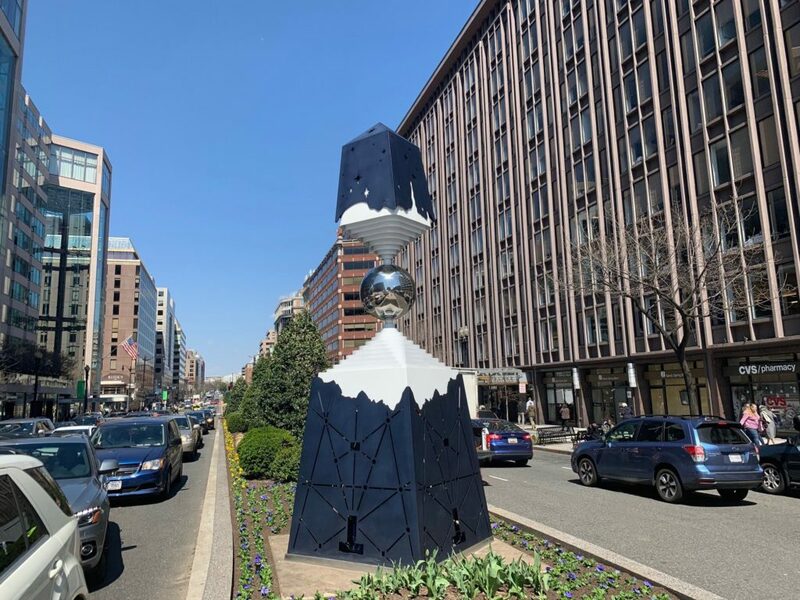 Up ’til Now is located at the Connecticut Avenue Overlook south of Dupont Circle, while Axis Mundi is installed on Connecticut Avenue NW and K Street. Durrett’s Up ’til Now evokes the history of the area’s landscape and architecture. It envisions the forests, thickets, marshes, and springs from hundreds of years ago gradually giving way to the roadways, infrastructure, and buildings that shape our built environment today. Looking through the peephole on the front of the structure, one can see a diorama invoking the rolling terrain blanketing DC hundreds of years ago before colonial times. Durrett also summons the Victorian rowhomes later populating this area through the architectural shape and ornamentation of her sculpture. Kate Raudenbush’s Axis Mundi is a futuristic landmark that echoes the shape of an ancient obelisk, a type of monument used to mark places of importance. The sculpture references both the dynamic diagonal patterns of Pierre Charles L’Enfant’s city plan for Washington, DC and star patterns that connect the city to the sky above. This modern obelisk marks the physical place, while a mirrored sphere reflects the people who surround it and form the vital center of our city. Utilizing the sphere as a symbol of a living democracy and of inclusivity, the sculpture shows the power of the people to influence society. Axis Mundi asks: What does it mean to work here, at the axis of one of the world’s most important cities? What is our role in shaping a better world?